Every now and then something magical happens. Some people call it Serendipity. All I know is that when something good; something joyful; something that strikes like a thunder clap occurs it makes life worth living. Or perhaps it simply allows us to see a bit more clearly, or to have the strength to get up for another day. When I was a kid, I lived in Arlington Heights Illinois. Like any teenager, friends were important: those were the folks that showed me how to start weaving the tapestry of my own life. Those were the guys who helped me explore: bicycle trips, girls, Scouts, girls, music, girls, religion, girls, nature, girls, and the world around me, which very much included girls. I never kept friends too close possibly because I was bound to move on. That's what happens when you're an airline pilot's son. You move and move: from Illinois to California to New York to Florida to Washington State to Ireland. Along the way, you'll pick up treasures that you can take with you and that are easily transported: the glory of a sunset; the fun of a beach; the memory of a first kiss. But you can't take friends with you. They don't pack too well. So instead you save the memories in your mind's photo album, taking them out occasionally to study them like a worn but valuable stamp collection. When I was 13, I had a couple of good friends: Jeff, Terry...and my best friend Steve. Steve was taller than me (easy to do); he was stronger than me (easier to do); he could play the Guitar better than me (easiest of all). And I looked up to him and treasured him because I had at last found a real friend. We hung out together. We played Guitar together. We talked about girls together. He was the guy that I stammered to when I finally got to 2nd Base with Barbara Whazhername. He laughed like hell because I was so damned innocent. Like a character out of Summer of '42, my hand had initially turned left rather than right at the first obstacle. But I finally found my double objective, or so my memory remembers. When Steve laughed at my innocence I laughed with him. I laughed because he was my friend and I loved him. Usually, I'm the guy who leaves when my father would sadly state that we'd have to move. This time, in 1970, it was Steve. His folks were moving back to their homestead way down in the Southern US, and they were insisting that he come with him. Damn. It almost broke my heart. We did our best to keep in touch, a couple of boys writing letters separated by a couple of States, a few thousand miles, and wildly different experiences. But as the months passed, our letters became less frequent. Finally, they stopped all together. We lost touch. For the next forty years we stayed out of touch. Then only today, I found him again. Or he found me. He saw me on Facebook, and he emailed me. It's a damned miracle, is all I can say. And all because of Music and a new Guitar. Just like it was when Steve and I played together. I wrote him instantly. This is what I wrote to him. And it's true. Every word. I'd always had music in my life one way or another. 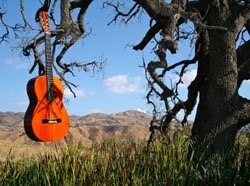 A song, a guitar, albums.... Over the years and as kids and grandkids came along, music was shelved to make room for family, work, and the clutter that goes with living. I even managed to break the neck of that old Harmony Guitar that I had when we were kids. I'd taken it all the way to Ireland with me, and the music died 10 years ago. Then only last week I'm walking through the small town of Navan where I've lived since 82. I knew I needed a bit of personal music in my life. Across the street was a music shop. On the spur of the moment I walked in and bought a new guitar. I started playing it only days ago. And yes, I'm still horrible. More so now because the fingers have forgotten. Mind, I know it's like a bicycle. Hidden in there somewhere is an ancient memory, and until I remember I'll keep struggling. But while my stiff fingers picked the almost remembered strings, I thought of you. And then today, I heard from you. And that, I suspect, is what Music is all about. something wonderful about reconnecting with old old friends. I have reconnected with a friend that knew me from age 6 to age 12, we have a great time talking about "old times". Divorce is never easy, but it does get better as time goes on; the old adage "time heals all wounds"
I am sorry that you are going through a separation. It is not an easy thing, especially after so many years of marriage. It is great to find old friends and to pick up as if they had just stepped out of the room for a few minutes. I hope you and Steve will have a face to face reunion soon and wail away on your guitars as in days past. Well, you gave me a "warm fuzzy" reading that. That is probably the thing that can make all this technology stuff really worthwhile- it can sometimes help with personal connections. Please come back to us. You are sorely missed. I saw this happen with Mom over and over and over again. You rarely did because you weren't there, but I was. I lived it. History repeats itself and it's tearing us all apart. You know what you need to do, so just do it. I know no other way of reaching you, Tom. I do not know anything about Ireland: I live in the USA but I try to be open to the universe in front of me. I ,also, had a long lost friend that recently I reconnected with. We now go on a yearly camping trip and during the year we exchange letters and talk once in awhile on the phone. When you have a childhood friend , they become precious. You only get one or two if you are lucky so you have to treasure them. I wonder wether you are the guy I met at the entrance of super value in castletownbere yesterday in the afternoon. We had a chat about the wheather, which could be slightly better at that time. Obviously you are temporarily in the Eyeries region and my wife and me would be happy if you could drop in for a cup of tea in our cottage at rodeen/ctb. If you want so please call 70986. I just found your blog and your book. I hope that we find you back posting again soon, you add a lot to the world! Tom, are you still surviving Ireland? Did you have tea with the German? Is everything all right? True friendship never really dies. I'm glad I've read this post.